In the month of March most parts of South India start experiencing pre-monsoon activities which is currently evident in the region. During the last 24 hours from 8:30 am on Monday , isolated light rainfall activity was observed in parts of South India such as Kerala and Karnataka. Trace of rain was seen in the city of Bengaluru and Punalur. At present, the day temperatures over most places in South India are settling above 30˚C. Some places in Rayalaseema and Andhra Pradesh are recording maximums as high as 40˚C, which is resulting in hot day conditions. However, South Interior Karnataka is cooler with places like Mysore and Bengaluru recording day temperatures in the low 30’s due to their geographical location. Currently, a trough is extending from South Interior Karnataka up to Comorin region across interior parts of Tamil Nadu. The rains observed during the last 24 hours were in association with this weather system. Similar weather conditions are expected to prevail in the region for next 48 hours. 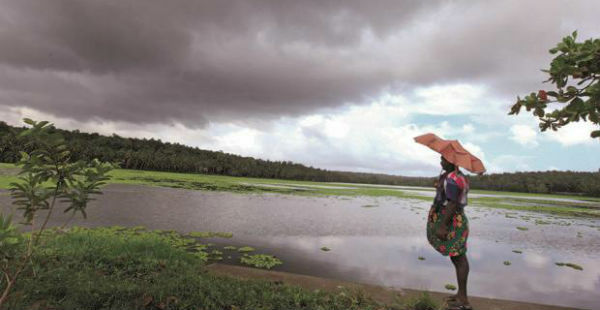 Isolated patchy rain and thundershower activities can occur in parts of Kerala and Interior Tamil Nadu. From March 8 onward, the intensity of rain will increase, particularly in Tamil Nadu and Kerala. The weather activity will mostly happen during the later parts of the days. The weather conditions in southern peninsula will however, remain warm and hot during the day time.